My Soul is full of whispered song; My Blindness is my sight; The shadows that I feared so long are all alive with light. 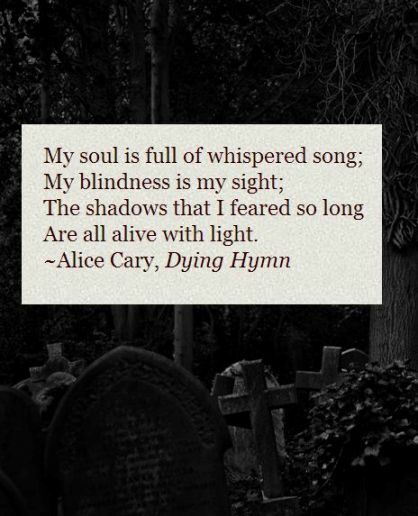 Alice Cary was an American poet, and the sister of fellow poet Phoebe Cary. Alice Cary was born on April 26, 1820, in Mount Healthy, Ohio near Cincinnati. 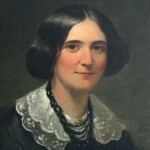 Her parents lived on a farm bought by Robert Cary in 1813 in what is now North College Hill, Ohio. He called the 27 acres Clovernook Farm. The farm was 10 miles north of Cincinnati, a good distance from schools, and the father could not afford to give their large family of nine children a very good education. But Alice and her sister Phoebe were fond of reading and studied all they could. Alice died of tuberculosis in 1871 in New York at age 51. The pallbearers at her funeral included P. T. Barnum and Horace Greeley. Her burial is in the Green-Wood Cemetery, Brooklyn, New York. The Cary Home stands today on the east side of Hamilton Avenue, on the campus of the Clovernook Center for the Blind and Visually Impaired in North College Hill.